These are pictures of Ganesh Chaturthi in Mumbai in 2016. Article has Ganpati photos of the best and most famous Ganesh Idols in Mumbai in 2016. It also has info on Ganpati Visarjan (Immersion), the best Ganesh Mandals in Mumbai and famous Ganpati Murti (Idol) makers in Mumbai. 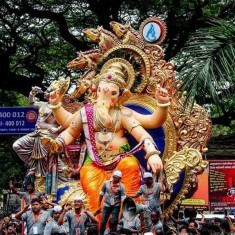 NOTE: This link has information on Mumbai Ganesh Visarjan (Immersion) Route, Location, Map. 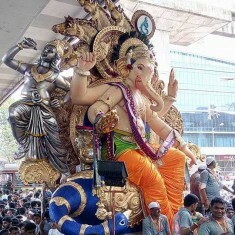 “Lalbaug Cha Raja” is Mumbai’s Most Famous Ganesh Idol. It is estimated that during Ganesh Chaturthi 1 million (10 Lakh) devotees visit “Lalbaug Cha Raja” everyday for Darshan (prayers and blessing). This makes “Lalbaug Cha Raja” Mumbai’s most visited Ganpati Idol during the annual Ganesh Festival. 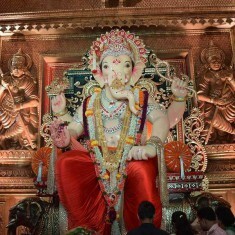 “Lalbaug Cha Raja” Ganpati Murti (idol) was started in 1934. Since 1935 the Kambli family (Kambli Arts) have been making the Lalbaugcha Raja murti. 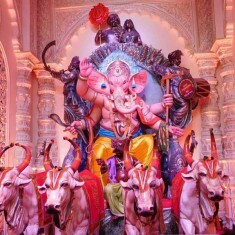 The third generation of Ganesh sculptors from the Kambli family are currently involved in making the Lalbaugh Cha Raja. The face and body of “Lalbaug Cha Raja” Ganpati does not change much from year-to-year. What changes is the grand set or Ganesh Pandal where the Lalbaugh Cha Raja is kept. What also changes is the throne, clothes, decoration and weapons of Mumbai’s most visited Ganesh Idol. Unlike most other Ganesh idols in Mumbai, where the Ganpati is fat, Lalbagh Cha Raja Ganesh Murti is slim. Once the murti has been made and assembled, Mr Ratnakar Kambli, the head of Kambli family, paints the kindly eyes of the Lalbaug Cha Raja. The reason Lalbaug Cha Raja is Mumbai’s most popular and famous Ganpati is because devotees believe that it grants their wishes. Which is why there are two lines for devotees at the Pandal – one is for regular visitors who come to see the idol and the other is for those who want to ask for something (“Mannat”) from Lalbaug Cha Raja. The 2016 Lalbaug Cha Raja is a 14 feet Ganesh idol sitting on a large owl throne. The striking large eyes of the owl are almost as big as the head of Lalbaghcha Raja. The beautiful set design and the stunning looking owl throne, make Lalbaug Cha Raja one of the best Best Ganesh Pandals in Mumbai in 2016. Some people are trying to rake up a controversy on social media about the 2016 Lalbaug Cha Raja Ganesha. 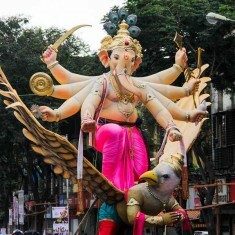 They claim that the owl overlooking the Lalbaug Cha Raja Idol is a symbol of evil. On the contrary, in Hindu mythology the Owl (“Uluka”) is a carrier of Goddess Lakshmi (the Hindu Goddess of Wealth), and it has a positive spiritual connotation. 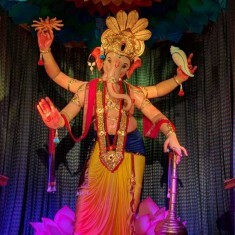 The “Lalbaug Cha Raja” Ganesh Murti is managed by “Lalbaugcha Raja Sarvajanik Ganesh Mandal”. For most Mumbaikars Khetwadi is a must-visit location during Ganesh Chaturthi. Practically every lane in Khetwadi has a grand Ganesh Murti. Of all the Ganesh Pandals in Khetwadi, the Khetwadi Lane 12 (“Khetwadi Cha Ganraj”) Ganesh Pandal is the best. The Khetwadicha Ganraj sits in a grand palace which has beautiful statues, decorations, ornaments and chandeliers. This palatial Pandal is influenced by a mix of Rajasthani and Italian design. During the 2016 Ganesh Chaturthi festival, there are more creative Ganpati murtis (idols) in Khetwadi; but the tall and regal Khetwadi Cha Ganraj Ganpati stands out because of its tall size, wonderful ornaments, beautiful clothes, makeup and most important the set design around the Ganraj. The wonderful design of the pandal, the large size of the pandal, the lightening, music and air conditioning, all these add to the sense of awe which a devotee feels when visiting the Khetwadi Galli 12 Ganpati. The 2016 Khetwadi Lane 12 (Khetwadi Cha Ganraj) Ganesh Idol is made by murtikar (Ganesh Idol Maker) Raju Shinde. The basic design of the murti has not changed much over the past few years. Khetwadi Cha Ganraj has consistently been winning prizes for being among the best Ganesh Pandal and Ganpati Murti in Mumbai. TOI awarded this Murti the Second Best Ganpati Idol in Mumbai in 2016. The Khetwadi Lane 12 (Khetwadi Cha Ganraj) is managed by “12th Khetwadi Sarvajanik Ganeshotsav Mandal”. The 2016 Raja Tejukaya Ganpati and the set (Ganesh Pandal) where it is housed is one of the best in Mumbai this Ganesh Chaturthi. The face of the amazing 2016 Raja Tejukaya Ganesh idol has narrow slant-eyes, with large pink ears. It looks similar to idols from previous years. 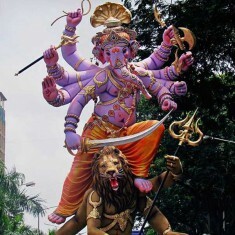 The overall effect is an aggressive looking Ganpati that is awe inspiring. The 2016 Raja Tejukaya is sitting on a carriage-throne that is driven by “Musakraj” (Ganesh’s mouse) and is drawn by 4 bulls. Raja Tejukaya’s throne depicts farmers. The Raja Tejukaya Mandal is highlighting the plight of farmers and the agrarian crisis in Maharashtra. In a nice touch, the four bulls carrying Raja Tejukaya move up and down, giving the impression that they are moving. The wonderful 2016 Raja Tejukaya Ganesh Murti is made by famous Ganpati Murtikar Rajan Zad. Incidentally, Mr Zhad is a resident of Tejukaya complex. In addition to a marvelous idol, what makes Raja Tejukaya a must visit Ganpati during the 2016 Ganesh Festival is the beautiful Ganesh Pandal. At the entrance there are a series of white elephant statues that greet visitors. The alter where Raja Tejukaya is placed has beautiful carvings. Lighting is used intelligently to enhance the ambience. All these make Raja Tejukaya one of the best Ganesh in Mumbai in 2016. Started in 1967, Raja Tejukaya is celebrating its 50th anniversary this year. What makes it even more special is that Tejukaya Chawls are going to be redeveloped into tall buildings and this work will start shortly. 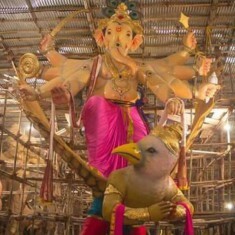 Tejukaya Sarvajanik Ganeshotsav Trust manages Tejukaya Raja Ganesh Idol. The 2016 “Mumbai Cha Raja” Ganpati of Ganesh Galli, Lalbaug, is an imposing idol. The 22 feet murti is standing on a lotus flower. What makes “Mumbai Cha Raja” one of the best Ganpati in Mumbai, during the 2016 Ganesh Chaturthi festival, is the amazing Pandal. The “Mumbaicha Raja” Ganesh Pandal is a 60 feet high replica of the holy Badrinath Temple in Uttarakhand. There is an artificial pond in front of the Mandir. Mumbai Cha Raja (Ganesh Gali) is one of the three famous Ganesh Idols from Mumbai’s Lalbaug area. The other two famous Ganpatis from Lalbagh are “Lalbaug Cha Raja” (founded in 1934) and “Raja Tejukaya” (founded in 1967). 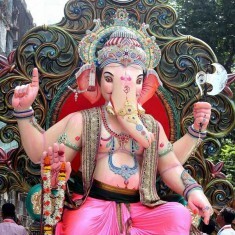 Started in 1928, Mumbai Cha Raja (Ganesh Galli) is among the oldest Ganesh idols in Mumbai. 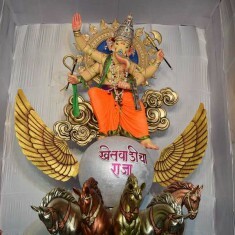 The 2016 Mumbaicha Raja Ganesh Murti (Idol) is made by Satish Walivadekar and it is managed by Lalbaug Sarvajanik Ganesh Utsav Mandal (Ganesh Galli). 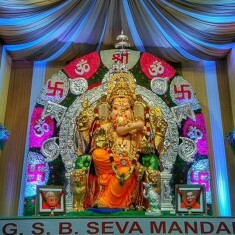 GSB Seva Mandal (King Circle, Sion) is the richest Ganpati Mandal in Mumbai. 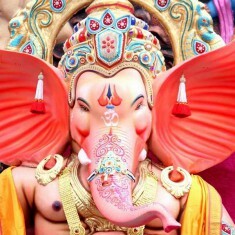 It is also considered the richest Ganesh in the world. The amazing GSB Seva Ganesh has 68 Kgs of Gold and 300 Kgs of Silver. During Ganesh Chaturthi 2016, GSB has insured the Ganesh Mandal for Rs 300 crores (Rs 3 billion). It is amazing that the tall 21 feet GSB Seva Mandal Ganesh Idol is made of clay and hence it is ecofriendly. The GSB Seva Mandal Ganpati murti is made by Murtikars (Ganesh Idol Sculptors) Avinash Patkar and Ashish Patkar of Patkar Arts, Girgaon. Patkar Arts has specialized in making Shadu (Clay) Ganpati idols for over 100 years. Over the last few years, GSB Seva Mandal (King Cirle) Ganesh Murti has been among the Top 3 winner for the best Ganpati Idol in Mumbai. In 2016 TOI declared the GSB Seva Mandal (King’s Circle) the most visited Ganpati in Mumbai. GSB Seva Mandal Ganesh Visarjan (Immersion) takes place after 5 days. Unlike most other Ganpati Pandals in Mumbai, Ganesh Darshan (prayer and offering) at GSB Seva Mandal takes places 24 hours of the day. The first GSB (King Circle – Sion) Ganesha was installed in 1955 by Goud Saraswat Brahmin (GSB) Seva Mandal. The Goud Saraswat Brahmin (GSB) community has organizations in other parts of Mumbai too, where Ganesh Festival is celebrated. The other famous Mumbai GSB Ganesh Idol is at Wadala and is managed by Goud Saraswat Brahmin Sarvajanik Ganeshotsav Samiti, Wadala. Started in 1962, the Khetwadi Lane 11 Ganpati Idol is called “Mumbaicha Maharaja”. The Khetwadi Gali 11 Ganesh Murti (Idol) has consistently been among the most creative and imaginative in Mumbai. 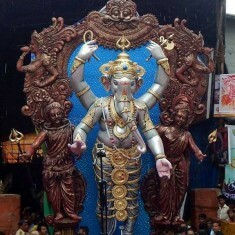 The 2016 Khetwadi Galli 11 “Mumbaicha Maharaja” Ganpati is designed and made by famous Murtikar (Idol Maker) Vijay Khatu. The 10 hand Khetwadi Ganpati standing on a half cow- half man is among the best Ganesh Idols in Mumbai during Ganesh Chaturthi 2016. In addition to an awesome Ganpati Idol, “Mumbai Cha Maharaja” Pandal (enclosure where the Ganesh Idol is kept) is also among the best Pandals in Mumbai. 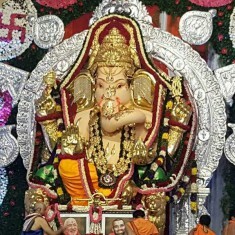 “Mumbaicha Maharaja” Ganpati is managed by Khetwadi 11 Galli Sarvajanik Ganeshotsav Mandal. 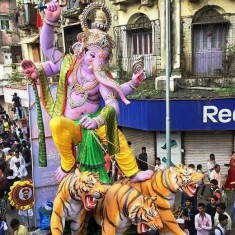 2016 Mumbadevi Cha Ganraj is a majestic blue coloured Ganesh riding on 3 tigers. Mumbadevicha Ganraj Ganesh Idol is made by Murtikar (sculptor) Krunal Patil. Mumbadevi Cha Ganraj Ganpati Idol is organized by Parmanand Wadi Bal Mitra Mandal. 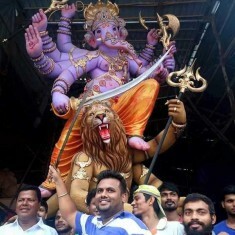 The 2016 Dharavi Cha Sukhkarta Idol is an eight hand Ganesh standing on the shoulder of a half human – half lion. The half man and lion could possible be Narasimha, an avatar of Lord Vishnu. 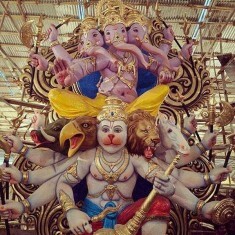 The strikingly creative Dharavicha Sukhkarta Ganpati idol is made by murtikar (sculptor) Krunal Patil. In the above picture Krunal Patil is standing in front of Dharavi Cha Sukhkarta Ganesh Murti (Idol). 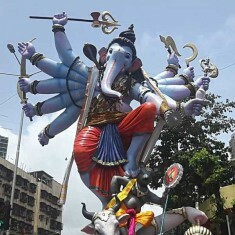 “Dharavi Cha Sukhakarta” Ganpati Murti is managed by New Bharat Sarvajanik Ganeshotsav Mandal. “Chinchpokli Cha Chintamani” started in 1920 in Chinchpokli. “Chinchpoklicha Chintamani” is among the oldest and most famous Ganesh Idols in Mumbai. Every year large crowds of devotees take part in the “Aagman” ceremony, where the Chintamani Ganpati Murti is taken from the workshop to the Pandal near Chinchpokli Station. The 2016 “Chinchpokli Cha Chintamani” Ganesh Idol is made by Vijay Khatu at his Parel workshop. As with previous Ganesh Chaturthi, the large 2016 “Chinchpokli Cha Chintamani” is sitting majestically on his throne. On his throne is a large calligraphy which is the symbol of “Chinchpoklicha Chintamani”. “Chinchpokli Cha Chintamani” Ganpati Murti was awarded the Best Ganesh Idol in Mumbai in 2016 by TOI. “Chinchpokli Cha Chintamani” is managed by Chinchpokli Sarvajanik Utsav Mandal. Year after year the Tulsiwadi Cha Maharaja Ganpati looks different. Anticipating a lovely new Ganesh Murti (idol) every year, devotees eagerly await the Tulsiwadi Cha Maharaja. The 2016 Tulsiwadicha Maharaja is a tall and imposing purple-grey Ganesh Idol. Its throne, ornaments and clothes add to its elegant stature. The 2016 Tulsiwadicha Maharaja is made by Sculptor Vijay Khatu and it is among the best Ganesh Idols during the 2016 Mumbai Ganesh Festival. Mumbai’s famous Tulsiwadi Cha Maharaja Ganpati was first installed in 1939. Tulsiwadi Cha Maharaja Ganpati Pandal is located at Tulsiwadi (Tardeo) near Haji Ali and Sobo Central Mall. Tulsiwadi Cha Maharaja is managed by Tulshiwadicha Maharaja Sarvajanik Ganesh Utsav Mandal. 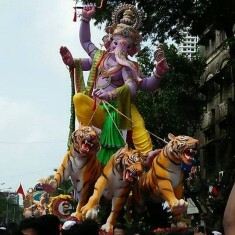 “Andheri Cha Raja” is also called “Navsara Pavnara Andheri Cha Raja”. This is because it is thought that it grants the wishes his follower. The basic design of the 8.5 feet tall “Andheri Cha Raja” Ganesh Idol has not changed since its inception 51 years ago. Over the years the Navasara Pavnara Andheri Cha Raja Ganpati has among the best Ganesh Pandal in Mumbai. In 2016 too, the Andheri Cha Raja Ganpati Pandal is amazing. It is a large replica of the beautiful Kunkeshwar Temple in Sindhudurg, Konkan. Before arriving at the Andheri Cha Raja visitors pass a large 15 feet Diya (lamp) followed by statues of the 10 avatars of Lord Vishnu and eight Ashtavinayaka. “Ashtavinayak” temples are the eight holy Ganpati temples in Maharashtra. TOI awarded the second best Ganesh Mandal prize in 2016 to Anderi Cha Raja. Navsara Pavnara Andheri Cha Raja Ganesh is the most popular Ganesha in Mumbai’s Western suburbs. Film and TV celebrities offering Ganesh “Darshan” have added to the popularity of Andhericha Raja. Navasara Pavnara Andheri Cha Raja is the only large Ganesh Murti in Mumbai whose “Visarjan” (immersion) takes place after 16 days, which is “Sankashti Chaturthi” as per the Hindu calander. There is a small idol of Andheri Cha Raja whose Ganesh Visarjan is done as usual after 10 days on “Anant Chaturthi”. Andheri Cha Raja is located at Mhada Colony, Azad Nagar, Andheri West,. It is managed by Azad Nagar Sarvajanik Utsav Samiti and was established in 1966. Khetwadi Cha Vignharata is the Khetwadi Gali 2 and 3 Ganpati Idol. The 2016 Khetwadi Lane 2 and 3 Ganesh idol is riding on a chariot pulled by two peacocks. The 2016 “Khetwadi Cha Vignharata” Ganpati Murti is made by famous Ganesh Idol maker Vijay Khatu. Khetwadi Galli 2 and 3 Ganpati is managed by Khetwadi Lane No.2 Sarvajanik Ganesh Utsav Mandal. Over the last few years the “Mira Bhayander Cha Raja” Ganesh Idols have been very creative. At Ganesh Chaturthi (Ganesh Festival) 2016 too it is among the best Ganesh Murti (Idol) in the Western and Northern suburbs of Mumbai. The 2016 “Mira Bhayander Cha Raja” Ganpati is designed and made by the famous Ganesh Murtikar (idol maker) Krunal Patil. A three headed blue Ganpati is sitting on a man with five different heads, which are a horse’s head, lion’s head, monkey’s head an eagle’s head and a wild boar’s head. The “Mira-Bhayander Cha Raja” Ganpati is organized by the Siddhivinayak Seva Mandal. The Akhil Chandanwadi Ganpati is among the well-known Ganesh idols in South Mumbai. The Akhil Chandanwadi Ganesh Pandal is located at 69/71 Yashwant Chowk, Chandan Wadi near Marine Lines Station. 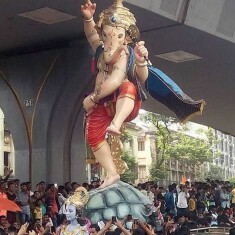 The 2016 Akhil Chandanwadi Ganesh Idol is dancing on a tortoise. 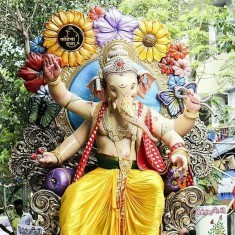 This Ganesh Murti is created by Mumbai’s renowned Ganpati Idol Maker – Vijay Khatu. The Akhil Chandanwadi Ganesh is managed by Akhil Chandanwadi Sarvajanik Ganeshotsav Mandal. “Currey Road Cha Kaivari” is among the more striking looking Ganesh Idols during Mumbai’s Ganesh Festival. Currey Road Cha Kaivari Ganesh is aggressive looking with large red ears. Each ear is almost the size of the Elephant God’s head. The basic look of Currey Road Cha Kaivari Ganpati has not changed much; but there have been changes to his clothes, ornaments, throne, etc and his pandal. The 2016 Currey Road Cha Kaivari Ganesh Idol is seated on throne which has Hanuman on his right and Lord Ram on his left. This attention grabbing Ganpati Murti is made by murtikar (statue maker) Rajan Zad. “Currey Road Cha Kaivari” Ganpati is managed by “Balgopal Sarvajanik Ganeshotsav Mandal”. “Fort Cha Raja” is a famous Ganpati Murti from Fort in South Mumbai. 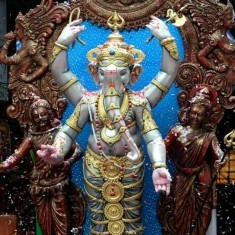 Started in 1962, “Fortcha Raja” Ganesh is located at Dwarkadas Lane near CST Station, in Fort. In recent Ganesh Chaturthis, Fort Cha Raja Ganesh Idol is house in beautifully created Ganpati Pandals. “Fort Cha Raja” Ganesha Idol is organized by “Shree Bal Gopal Sarvajanik Ganeshotsav Mandal”. “Dongricha Raja” Ganpati is among the oldest and most famous Ganesha Idols in the dock area of South Mumbai. The 2016 Ganesh Chaturthi “Dongricha Raja” Ganesh Idol has not changed much in appearance as compared to previous years. “Dongricha Raja” sits comfortably on his throne. The 2016 Ganesh statue of “Dongricha Raja” was made by sculptor Manohar bagwe of Bagwe Arts. The Ganesh Pandal of “Dongri Cha Raja” is located at Ganesh Chowk, Dr Maisheri Marg, Dongri, Mumbai. Dongricha Raja was started in 1939 and is managed by Chinch Bandar Dongri Sarvajanik Ganeshotsav Mandal. 2016 is the 78th year of Dongri Cha Raja Ganpati. The 25 feet tall “Khetwadi Cha Raja” (Khambatta Lane) Ganesh is standing on a globe which is on a horse carriage drawn by 5 horses. Khetwadicha Raja Ganesh Idol is among the more creative murtis during Ganesh Chaturthi 2016. Krunal Patil, who is among Mumbai’s best Ganesh Idol sculptors (“Murtikar”) has made the 2016 Khetwadi Cha Raja. Sadly the Ganesh Pandal is rather plain. The Khambata Lane Ganpati would have been a standout with better set decoration in its Pandal. Started in 1970, the Khetwadi Khambatta Lane Ganpati is managed by “Khambata Road Sarvajanik Ganeshotsav Mandal”. Over the last few years, the Kamathipura Cha Chintamani Ganesh Murti (Idol) has been among the more creative and exciting Ganpati in Mumbai. For 2016 Ganesh Chaturthi, the eight hand Kamathipuracha Chintamani Ganpati is riding on “Garuda”. “Garuda” is a half eagle and half man, and is the carrier of Lord Vishnu. The wonderful 2016 Kamatipura Cha Chintamani Ganesh statue is made by famous Murtikar (Sculptor) Vijay Khatu. “Kamatipura Cha Chintamani” Ganpati is managed by Siddhivinayak Mitra Mandal and the Ganesh Pandal is located in Lane 14 of Mumbai’s Red Light area of Kamatipura. Times of India, Mumbai’s leading daily newspaper, holds a contest for the best Ganesh Murti (Idol) and Ganpati Mandal in Mumbai. These are the list of 2016 Winners. 1st PRIZE: BEST GANESH IDOL IN MUMBAI “Chinchpokli Cha Chintamani” (Chinchpokli Sarvajanik Utsav Mandal). Murtikar Vijay Khatu. 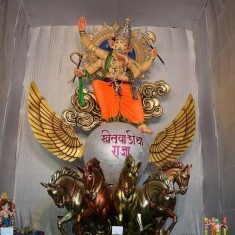 “Chinchpokli Cha Chintamani” (Chinchpokli Sarvajanik Utsav Mandal) GSB Seva Mandal (Kings Circle, Sion) “Khetwadicha Ganraj” (Khetwadi 12th Lane). Idol by Raju Shinde. “Khetwadicha Ganraj” (Khetwadi 12th Lane). 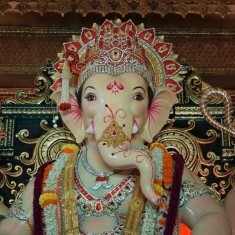 Ganpati Idol made by Raju Shinde. 2nd PRIZE: BEST GANPATI MANDAL IN MUMBAI Azad Nagar Sarvajanik Utsav Samiti (“Andheri Cha Raja”) at Azad Nagar, Andheri West. Pandal based on “Kunkeshwar Temple”. Sahyadri Krida Mandal at Tilak Nagar, Chembur Mumbai Ganesh Mahotsav by Lodha Foundation, Grant Road Fort Vibhag Sarvajanik Ganesh Utsav Mandal (“Fortcha Icchapurti”) – Mysore Palace Mumbai Ganesh Mahotsav by Lodha Foundation, Grant Road. Art director Nitin Desai. 3rd PRIZE: BEST GANPATI MANDAL IN MUMBAI Abhyudaya Nagar Sarvajanik Ganesh Utsav Mandal at Abhyudaya Nagar, Kalachowki. Pandal is based on Mysore Palace. 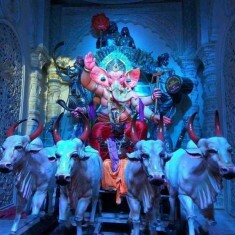 “Andheri Cha Raja” (Azad Nagar Sarvajanik Ganesh Utsav Mandal, Andheri West) Shiv Chhaya Mitra Mandal, Turbhe Sarvajanik Ganeshotsav Mandal ( Vashi Sector 17) Khetwadi 12th Lane, Girgaum. Mandal based on ISKCON temple. Art director Dilip Dada. These are the nominations for Best Mumbai Ganpati in 2016. Ganesh Chaturthi (Ganesh Festival) starts on 5 September, 2016 (Monday) and ends on 15 September, 2016 (Thursday), which is “Anant Chaturdashi”. 5 September, 2016 (Monday): Start of Ganesh Chaturthi. 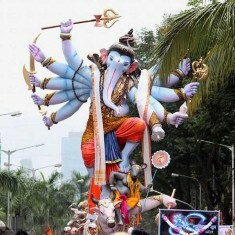 Devotees bring home Ganpati Murti and pray to Lord Ganesh. Friends and relatives visit homes where there are Ganesh Idols. Ganesh Mandals install Ganesh Murti (Ganpati Idol) at their Ganesh Pandals. Around 200,000 Ganesh Idols are bought in Mumbai during Ganesh Utsav (Ganesh Festival). 6 September, 2016 (Tuesday): First day of Ganpati Visarjan. Many of the small Ganesh Murtis (Ganesh Idols), belonging to families, are immersed on this day. It is estimated that 95% of the Ganpati Idols in Mumbai are placed in individual homes. 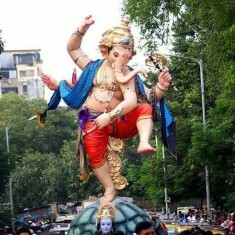 This Ganesh Visarjan is also called one and half day Ganpati Visarjan. 7 September, 2016 (Wednesday): This is the third day of Ganesh Chaturti and a few Ganpati Mortis are immersed on this day. 9 September, 2016 (Friday): The fifth day of Ganesh Chaturthi is the day for Gauri Visarjan. Goddess Gauri (also known as Parvati and Durga) is the mother of Ganesha. It is a popular custom in Mumbai and Maharashtra to keep an idol of Goddess Gauri during Ganesh Chaturthi. Special Gauri Puja is done the day before Gauri Visarjan. Ganesh Visarjan of the world’s richest Ganpati, GSB Seva Mandal’s Ganesh Idol, is done on this day. 11 September, 2016 (Sunday): This is the seventh day of Ganesh Chaturthi and Ganpati immersions of Ganesh Statues are done on this day. 14 September, 2016 (Wednesday): Tenth day of Ganesh Chaturthi is also a day for Ganpati Visarjan. 15 September, 2016 (Thursday): Today is Anant Chaturdashi, the final day of Ganesh Chaturthi. Ganesh Visarjan of many of Mumbai’s biggest Ganesh idols is done on this day. Most of Mumbai’s biggest Ganesh Mandals immerse their Ganpati Murti on this day. Listed below are the best Ganesh Murtis (Idols) in Mumbai and the Ganesh Mandals that organize these Ganpati Murtis. Address of all these Ganesh Idols can be found in the below map. GSB Seva Mandal is the richest Ganpati Mandal in the world. The GSB Seva Ganesh Murti is regularly wins award for being among the best in Mumbai. The GSB Seva Ganesha Idol is adorned with jewelry donated by devotees. Immersion of this murti is done on the fifth day. This Ganesh Pandal is at G.S.B. Sports Club Ground, King Circle. This is among the few Mumbai Ganesh Mandals that serve food to devotees. Lalbaugcha Raja is probably the most famous Ganesh Idol in the world. It estimated that 150 lakh devotees pray to Lalbaugcha Raja during Ganesh Chaturthi. Worshippers stand for hours in line to pray to Lalbaug Cha Raja. Lalbaugcha Raja Ganesh Pandal is managed by Lalbaugcha Raja Sarvajanik Ganesh Mandal. Mumbaicha Raja is the famous Ganpati Murti at Ganesh Galli, Lalbagh. 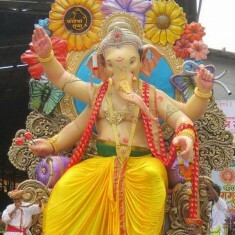 Lalbaug Sarvajanik Utsav Mandal has been organizing the Mumbaicha Raja Ganpati since 1928. Every year Mumbai Cha Raja is housed in a beautiful Ganpati Pandal. Khetwadicha Ganraj is at Khetwadi Gali 12 and is managed by 12th Khetwadi Sarvajanik Ganeshotsav Mandal. Khetwadi is famous for having the largest number of big Ganesh Idols in Mumbai. Khetwadicha Ganraj is among the most famous Ganpatis in Khetwadi. Khetwadi Land 12 Ganesh usually wins a prize for the best Ganpati Mandal and the best Ganesh Idol in Mumbai. 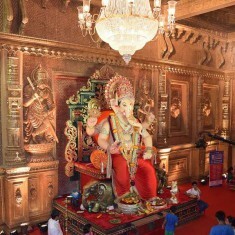 Mumbaicha Maharaja is organized by Mumbai Cha Maharaja Sarvajanik Ganeshotsav Mandal. It is located opposite Khetwadicha Ganraj, at Khetwadi Lane 11. Mumbaicha Maharaja Ganesh Idol is usually very creative and it is housed in a wonderful Ganesh Pandal. Khetwadicha Raja is located at Khetwadi’s Khambatta Lane. Khetwadi Cha Raja Ganesh Murti is organized by Khambata Road Sarvajanik Ganeshotsav Mandal. 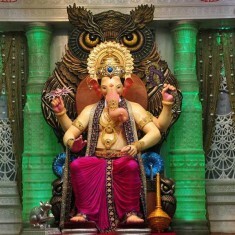 Bappa Khetwadicha is the Khetwadi Galli 10 Ganpati Idol that is organized by Om Tandav Sarvajanik Ganeshotsav Mandal. it is usually a very creative idol. Ladka Lambodar Ganpati is the Ganesh Idol of Rangari Badak Chawl, at Kalachowki. Ladka Lambodar is organized by Rangari Badak Chawl Ganpati Mandal. 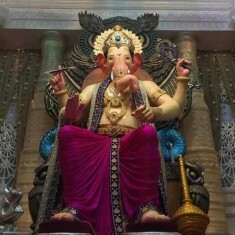 Chinchpokli Cha Chintamani is among the oldest Ganpati’s in Mumbai. 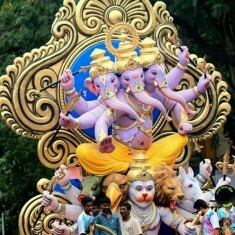 Chinchpokli Sarvajanik Utsav Mandal has been organizing the Chinchpoklicha Chintamani Ganesh since 1920. 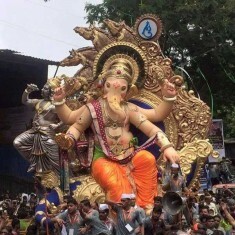 In 2015 Chinchpokli Cha Chintamani Ganpati Idol was voted the best Ganesh Murti (Idol) in Mumbai. Raja Tejukayacha is a fierce looking Ganpati Murti from Lalbagh. 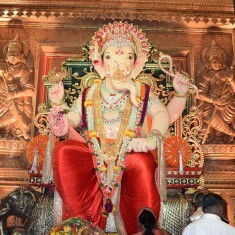 It is one of the three famous Ganpati Idols from Lalbaug in Central Mumbai. Raja Tejukayacha is organized by Tejukaya Sarvajanik Ganesh Ustov Mandal Trust. Tulsiwadi Cha Maharaja is the Ganesh Idol from Tulsiwadi in Tardeo. Tulsiwadicha Maharaja is organized by Tulsiwadi Sarvajanik Ganeshotsav Mandal. Kamatipuracha Chintamani Ganesh is organized by Kamathipura Sarvajanik Ganeshutsav Mandal. Dongri Cha Raja is a famous Ganpati Idol from Dongri in Central Mumbai. Dongricha Raja is organized by Chinch Bunder Dongri Sarvajanik Ganeshutsav Mandal. Fort Cha Raja is the Ganesh Idol from Fort, near CST Station. 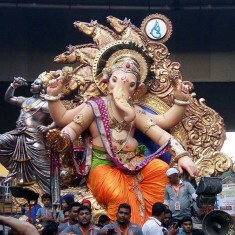 Fortcha Raja Ganpati is organized by Shree Balgopal Sarvajanik Ganeshotsav Mandal. 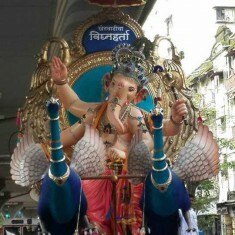 The Ganesh Idol of Chandanwadi, Chira Bazaar is organized by Akhil Chandanwadi Sarvajanik Ganeshustav Mandal. Vile Parle Cha Peshwa is the tallest environmently friendly Ganesh Idol in Mumbai. 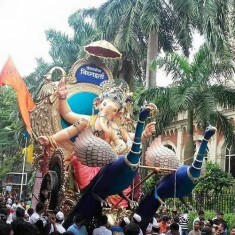 Since 2008 Bal Gopal Mitra Mandal has been hosting an eco-friendly Ganpati Murti. 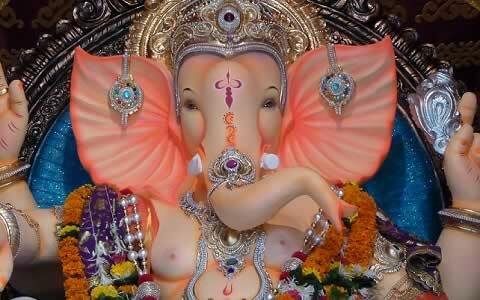 Vile Parle Vishwacha Raja is the Ganesh Murti organized by Bal Mitra Mandal Vile Parle. This Ganpati is at Vile Parle East. 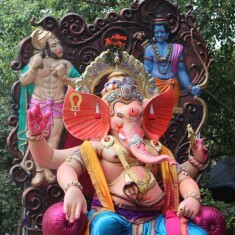 Vile Parle Cha Samrat is another famous Ganpati Idol from Vile Parle East. It is located opposite Bhuta High School. Navsala Pavnara Vasaicha Maharaja is a beautiful Ganpati from the Northen Mumbai suburb of Anand Nagar in Vasai. Anand Nagar Sarvajanik Geneshutsav Mandal organizes this Ganesh Idol. 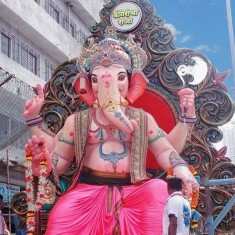 Andhericha Raja is also known as Navasala Pavnara Ganpati. Managed by Azad Nagar Sarvajanik Utsav Samiti, the 8.5 feet Andheri Cha Raja Ganesh Idol has remained unchanged for over 50 years. This is the only big Ganpati whose Visarjan does not take place on the final day of Ganesh Chaturthi, but five days later. Currey Road Cha Kaivari Ganesh Murti is organized by Balgopal Sarvajanik Ganeshotsav Mandal. 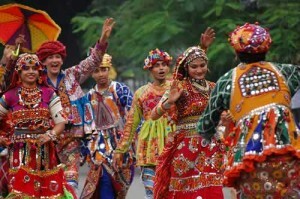 Navi Mumbai Ka Raja is organized by Shivchhaya Mitra Mandal. 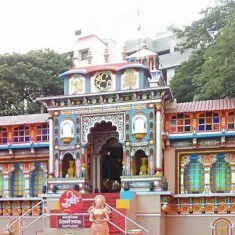 This Ganesh Pandal is at Ramtanumata Marg, Turbhe in Navi Mumbai. Sahyadri Krida Mandal’s Ganesh Idol is at Tilak Nagar in Chembur. This Ganesh Mandal regularly wins prizes for being among the best Ganpati Mandals in Mumbai. These are some of the best Ganpati Murti (Idol) makers in Mumbai. Many of these Ganesh Murti sculptor have their workshops at Parel. Work on Ganesh Idols usually starts 2 to 3 months before Ganesh Chaturti.